The 3 bedroom apartments feature Air-conditioning, Ceiling fan, Colour TV with free in-house movies, Clock radio, Hairdryer on request, Kitchen facilities, Free laundry facilities, Internet and fax data ports, Iron and ironing board, Private balcony, Refrigerator, Telephone DD/STD/ISD and Writing desk. The 3 Bedroom Apartment is an ideal for families or groups of firends travelling together. The apartment is a non smoking apartment featuring reverse cycle air-conditioning, a delightful balcony, 3 seperate bedrooms all with closets - 1 Queen Size Bed in the seperate master bedroom, your choice of either 1 Queen Size Bed or 2 Single Beds in the second seperate bedroom - please specify preference in the Special Requests Section of your Booking, 2 Single Beds in the third seperate bedroom, a large private bathroom including shower, bath, hair dryer and complimentary bathroom amenities, a spacious seperate living room with colour TV, FREE Austar TV, DVD player, high speed wireless internet access, work desk with lamp, international direct dial phone with voice mail, separate dial-up connection points & dedicated telephone lines for fax/modem, a fully equipped kitchen including microwave, refrigerator, dishwasher, oven, hotplates and tea/coffee making facilities, private laundry facilities with washing machine, clothes dryer and iron/ironing board, alarm clock, ceiling fan, radio, iron/ironing board and smoke detector. The rate is for 6 guests. The apartment caters for a maximum of 6 guests. All the comforts of a 'home away from home' . The 3 Bedroom 2 Bathroom Apartment is the perfect place to relax after a long day at work or exploring the beautiful city of Darwin. Ideal for a family, friends travelling together or corporate travellers, the apartment is fully air conditioned and non smoking, equipped with everything to enjoy your stay. Well appointed with tasteful modern furnishings, the apartment is self contained, spacious and comfortable, further offering 3 seperate bedrooms each with 1 comfortable Queen Bed and built in wardrobe, 2 private bathrooms with shower, toilet and hairdryer, a seperate living room with lounge suite, dining table and chairs, colour TV, DVD player, a fully equipped modern kitchen including a microwave, dishwasher, refrigerator and all cooking utensils as well as an array of electrical appliances for your convenience and to make your stay more relaxing. The private laundry facilities include a washing machine, clothes dryer and ironing equipment. All towels and linen are supplied. The private balcony offers spectacular views of the Darwin Harbour. The 3 Bedroom 2 Bathroom Apartment is a spacious, non smoking, modern and comfortable apartment - a quality alternative to traditional accommodation, offering guests a spacious fully self contained apartment for the price of hotel or motel rooms. Perfect for either a short or long term stay, the apartment is stylishly appointed, featuring modern features and natural light, 3 seperate bedrooms and 2 bathrooms, a spacious seperate open plan living room, fully equipped kitchen and private laundry. The apartment is ideal for a family, friends holidaying together or corporate business travellers, comprising reverse cycle air-conditioning and heating, a seperate master bedroom with your choice of either 1 comfortable King Bed or 2 Single Beds and private ensuite bathroom, a closet, digital alarm clock radio, two further seperate bedrooms each also with your choice of either 1 comfortable King Bed or 2 Single Beds, a private ensuite bathroom with shower, hairdryer, bathroom amenities and toilet, a spacious seperate open plan lounge dining room opening on to the pivate balcony, lounge suite, dining table and chairs, remote control TV, FREE Austar cable TV, ISD/STD direct dial phone with voicemail, DVD player, CD player, WI FI connection connection, dataport or RJ11 phone jack, a fully well equipped kitchens including stove, oven, microwave, toaster, crockery and cutlery, cooking utensils, kettle, fridge, tea and coffee making facilities, full private laundry facilities with ironing equipment, washing machine and clothes dryer, wake up calls and safe deposit box. The 3 Bedroom 2 Bathroom Executive Spa Apartment is a self contained, modern, spacious, comfortable and non smoking serviced apartment, ideal for a family, friends holidaying together or corporate travellers. The apartment has been designed for comfort, functionality and enjoyment with the focus on YOU having everything you need, so YOUR only focus is relaxing. Boasting a luxury spa bath and private balcony with stunning city views, the apartment offers air-conditioning, modern furnishings, ceiling fan, a seperate master bedroom with 1 comfortable Queen Bed, walk in wardrobe and private en suite bathroom, a second seperate bedroom with 1 comfortable Queen Bed, a third seperate bedroom with 2 Single Beds, wardrobes, luxury 1000 plus thread count sheets, radio, alarm clock, a second private bathroom with luxury spa bath, shower, toilet and hairdryer, a seperate spacious living room with modern lounge suite, dining table and chairs, flat-screen digital LCD HD TV, DVD player, CD player, a fully equipped kitchen with dishwasher, oven, stove, toaster, full-sized refrigerator/freezer, microwave, electric kettle, kitchenware, full private laundry facilities with washing machine, clothes dryer, ironing facilities, all linen and towels as well as a large undercover furnished private balcony with your own BBQ facilities. 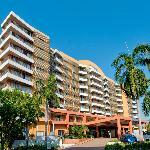 The Luxury 3 Bedroom 2 Bathroom Apartment overlooks the beautiful Wharf and Darwin Harbour. Prepare home cooked meals in the modern kitchen and entertain al fresco on your large private balcony with stunning water views. Ideal for a family or friends holidaying together, the apartment is a spacious, non smoking and air conditioned apartment offering an entry foyer leading into the spacious living area, ceiling fans, a seperate master bedroom with your choice of either 1 King Size Bed or 2 Single Beds and private ensuite bathroom, 2 further seperate bedrooms each with your choice of either 1 King Size Bed or 2 Single Beds, a second private bathroom with bath, shower, hairdryer and toilet, alarm clock, bathrobes, a very large seperate lounge/dining room opening on to the large private balcony with private BBQ, outdoor furniture and magnificent harbour views, comfortable lounge suite, dining table and chairs, coffee table, remote control TV, DVD player, CD player, WI FI internet connection, direct dialling phone, a fully equipped kitchen with with granite bench tops, ample cupboards, stove, oven, dishwasher, microwave, crockery/cutlery & cooking equipment, large fridge/freezer, tea and coffee making facilities, full laundry facilities with washing machine, ironing equipment and dryer. The 3 Bedroom 2 Bathroom Apartment with City Views overlooks the beautiful Convention Centre and Wave Pool below. Prepare home cooked meals in the modern kitchen and entertain al fresco on your large private balcony with stunning views. Ideal for a family or friends holidaying together, the apartment is a spacious, non smoking and air conditioned apartment offering an entry foyer leading into the spacious living area, ceiling fans, a seperate master bedroom with your choice of either 1 King Size Bed or 2 Single Beds and private ensuite bathroom, 2 further seperate bedrooms each with your choice of either 1 King Size Bed or 2 Single Beds, a second private bathroom with bath, shower, hairdryer and toilet, alarm clock, bathrobes, a very large seperate lounge/dining room opening on to the large private balcony with private BBQ, outdoor furniture and magnificent views, comfortable lounge suite, dining table and chairs, coffee table, remote control TV, DVD player, CD player, WI FI internet connection, direct dialling phone, a fully equipped kitchen with with granite bench tops, ample cupboards, stove, oven, dishwasher, microwave, crockery/cutlery & cooking equipment, large fridge/freezer, tea and coffee making facilities, full laundry facilities with washing machine, ironing equipment and dryer. The 3 Bedroom 2 Bathroom Harbourviews Apartment overlooks the beautiful Wharf and Darwin Harbour. Prepare home cooked meals in the modern kitchen and entertain al fresco on your large private balcony with stunning water views. Ideal for a family or friends holidaying together, the apartment is a spacious, non smoking and air conditioned apartment offering an entry foyer leading into the spacious living area, ceiling fans, a seperate master bedroom with your choice of either 1 King Size Bed or 2 Single Beds and private ensuite bathroom, 2 further seperate bedrooms each with your choice of either 1 King Size Bed or 2 Single Beds, a second private bathroom with bath, shower, hairdryer and toilet, alarm clock, bathrobes, a very large seperate lounge/dining room opening on to the large private balcony with private BBQ, outdoor furniture and magnificent harbour views, comfortable lounge suite, dining table and chairs, coffee table, remote control TV, DVD player, CD player, WI FI internet connection, direct dialling phone, a fully equipped kitchen with with granite bench tops, ample cupboards, stove, oven, dishwasher, microwave, crockery/cutlery & cooking equipment, large fridge/freezer, tea and coffee making facilities, full laundry facilities with washing machine, ironing equipment and dryer. 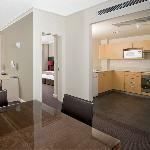 The Executive 3 Bedroom 2 Bathroom Apartment is a very spacious (280m2), comfortable and modern, non smoking apartment, luxuriously appointed with contemporary decor, furnishings, amenities and facilities designed to provide guests glamorous accommodation style in the heart of the Darwin CBD. Ideal for a family, group of friends on holiday or corporate travellers, the apartment features individual climate controlled reverse cycle air conditioning and heating, 3 separate bedroom with your choice of either 2 Queen Beds and 1 King Bed or 2 Queen Beds and 2 Single Beds, master bedroom with clock radio, iPod dock, 26" LCD television and private ensuite bathroom, a second modern private bathroom with shower, toilet, hairdryer and complimentary exclusive toiletries, a seperate spacious lounge dining room with lounge suite, dining table and chairs, LCD 32" Flat screen TV, FREE Austar cable TV, DVD player, direct dialling ISDN phone with voicemail, broadband cable connect internet connection, writing desk with lamp and chair, data-point, a fully equipped kitchen with cook-top, oven, microwave, refrigerator, all cooking utensils and dishwasher, fridge, tea and coffee making facilities, full private laundry facilities with washing machine, ironing equipment and clothes dryer. The apartment further features a private furnished balcony, ideal for alfresco dining. This air-conditioned apartment contains 3 separate bedrooms, a fully equipped kitchen with a refrigerator. Each room contains either a balcony or a verandah and a television with cable TV. Bathroom with shower only.